Late in the 19th century, Edvard Munch created a series of paintings which reflect tragedy and the personal anguish of his subjects. One glance at any of these works, and the viewer instantly understands that something really awful has just happened to the people in the scenes. What does “The Scream” a still-famous work which Munch painted in 1893 convey to you? There is an actual story behind the scream, which Munch relates, but does that story matter to the viewer’s experience with the painting? Why, or why not? 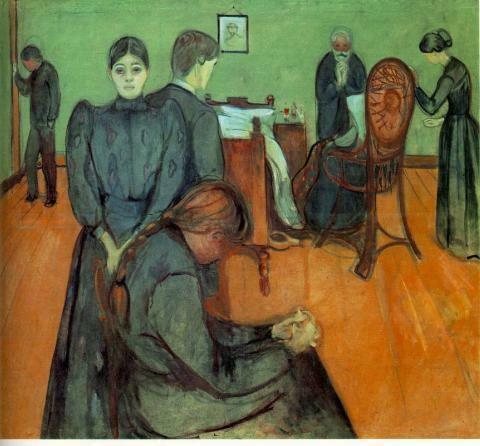 Spanish Flu was not-yet a threat to anyone when Munch painted “Death in the Sickroom,” in 1895, but it was eerily prophetic of difficult days ahead. What does that painting tell you? Are different people experiencing different emotions? 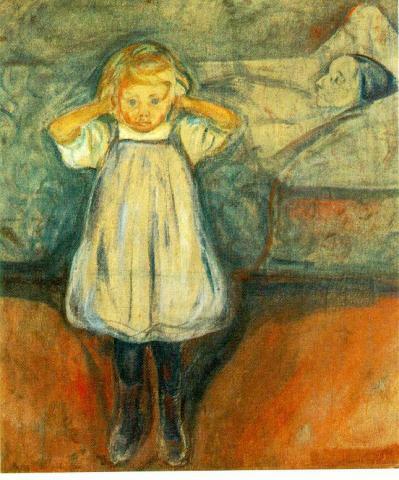 Does it make a difference to you that “Death in the Sickroom” reflects a personal time in Munch’s life - when his sister died? Why, or why not? If you didn’t know the back story of the painting, would you have any reason to believe that Munch knew the person who had just died? Explain your answer. What does “The Dead Mother,” which Munch created between 1899-1900, tell you about the loss of a loved one?